I see that CAMRA's Champion Beer of Britain for 2017 is Churchend Goat's Milk, a 3.8% beer described on the brewery's website as 'Golden yellow nectar. Pale barley, crystal malt and oats, blend to fill the palate with flavour. Aromatic hops dance over the tongue for a gentle hop finish.' That sounds like the kind of beer that is very popular at the moment, although that's not a criticism. 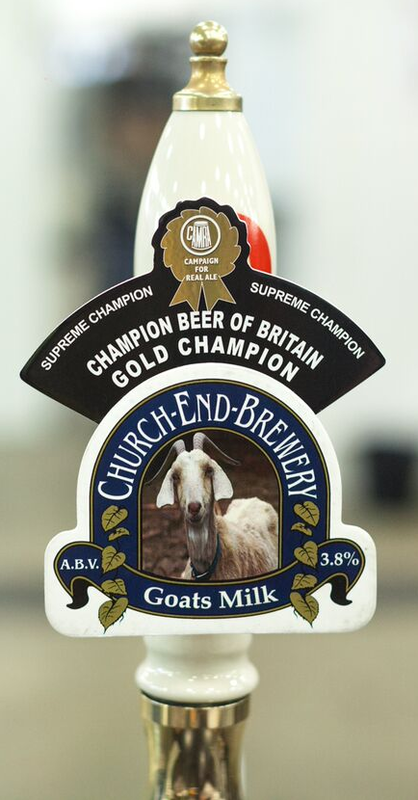 A brewery spokesperson explained the name: "We originally brewed and named it for a festival taking place in the Goat pub, and the beer just caught on." Silver in the Overall Winner category was won by Bishop Nick Brewery's Ridley’s Rite, with Tiny Rebel Cwtch taking the bronze. Two years ago, Cwtch won the Champion Beer award. When I tried Cwtch after it first won, I was distinctly unimpressed and didn't see it as anything special at all, which just goes to show how subjective judgements on flavour can be. Only two beers from around this area (Merseyside and Lancashire) feature, both from Blackedge Brewery in Horwich, which is about 25 miles from Southport: Pike won Silver in the Best Bitters category, and Black Port Porter won Joint Silver in the Speciality category. The only other beer from the North West was Red Bull Terrier from Barngates in Cumbria which won Silver in the Strong Bitter category. For the full list, click here and scroll down. It is difficult to comment on the beers that have won awards, seeing that, as far as I can recall, I've had only three of them: Cwtch Tiny Rebel, Oakham Citra and Saltaire Triple Chocoholic. I tend to take these awards with a pinch of salt because the final choice is made by a comparatively small number of people on a panel chosen by CAMRA. I'm not sure how it could be done otherwise because, as my own experience of knowing only three beers among the 2017 award winners shows, ordinary drinkers don't have access to the full range of beers available nationally - not unless they spend every waking hour touring pubs and beer festivals all over the country, in which case they'd also have to be quite rich. A simple ballot of all members would just throw up a bewildering range of local choices without any clear winner. While consultation among members does take place via local tasting panels and regional heats, in the end final decisions have to be made, so I accept this system, though imperfect, as probably about as good as we can get. Most industry awards are simply marketing devices. For example, the Oscars, which get a ridiculously disproportionate amount of attention, are no more than industry gongs awarded by insiders to each other. Impartial assessments of quality they are not. In fact, they are of less value to us consumers that, say, the UK Plumber of the Year award - much more use if your boiler packs in. The CAMRA awards are genuinely different in that they are not industry gongs, but awarded by outsiders from an independent campaign, which is why winning them is valued more highly than other awards determined by insiders: this award, brewers can justifiably claim, was decided by informed customers. Ultimately, while they're not perfect, they're not worthless either. If I were a brewer, I'd be very pleased to receive one. I've never had this particular beer, or even seen it on the bar, so can't really comment on its quality. However, I do wonder exactly what value it adds for either drinkers or the brewery itself to give the award to such a relatively obscure beer. And I've never seen Tiny Rebel Cwtch on a bar either. I've seen Cwtch only once on a bar. It is a valid point that the average drinker is unlikely ever to come across most of these beers. Winning the Champion award does usually result in a large increase in orders for the brewery concerned, sometimes well beyond their capacity to fulfil. A few of them have had to use contract brewers to meet demand, for example Coniston Bluebird. Apart from the publicity generated for CAMRA by this competition, you do have to question its value. As has been pointed out already, many past CBOB winners have been very obscure beers with limited distribution, and the fact that a winning brewery will sometimes have to contract production out to a larger brewery, negates the whole idea. btw. Do either of you know whether CAMRA’s top brass tried the “black-tie” dinner job to announce the awards? They pulled this trick last year, and received considerable criticism from brewers and members alike. I'm pretty sure I read that the black-tie dinner had been dropped this year. I don't know, although I can't see any mention of a posh dinner on the website. It was announced just after three o clock on the first day of the festival.